The Topricin pain relief cream has become more and more popular. This homeopathic treatment has received lots of positive reviews from the users. It is loaded with various natural extracts, and it is applicable for treating a wide variety of pain problems, from muscles soreness and bruising to nerve injury. So, how does it compare to the Arnica pain relief gel which has been the way to go for muscle pain and stiffness? Below, we will see the comparisons between Topricin vs Arnica to help you choose. 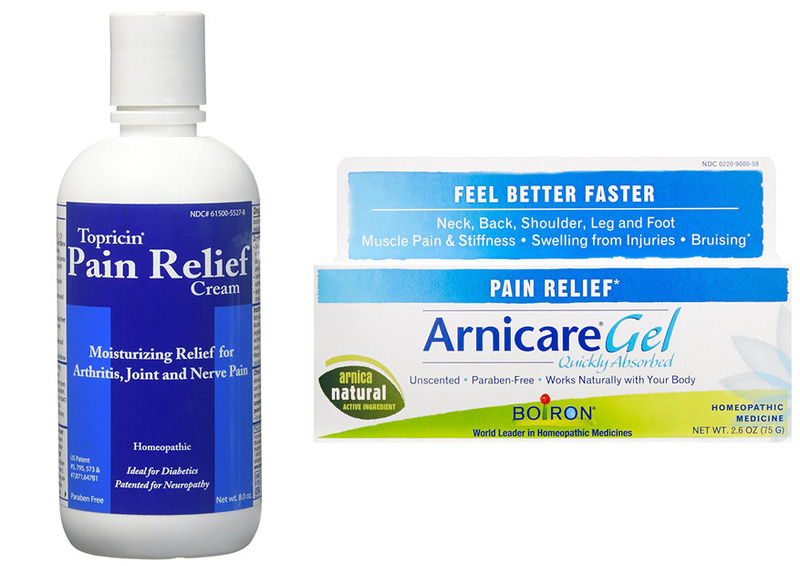 The Arnica pain relief gel is designed to treat muscle injury. According to the label and the information on the packaging of the product, Arnica can temporarily relieve muscle stiffness and muscle pain that are caused by a minor injury, fall, or overexertion. It can also reduce the pain, discoloration, and swelling of muscle bruises. However, it should not be applied directly to damaged skin and wounds. On the other hand, the Topricin pain relief cream is quite a multi-purpose product. The main idea is still the same; it is designed to relive pain. However, it also has moisturizing effects. It is not only applicable for muscle pain, but also joint and nerve pain, arthritis, carpal tunnel syndrome, and post-surgical pain. See our previous discussion about Topricin vs Traumeel. Both Arnica and Topricin are suitable for diabetic people. They are beneficial for people who cannot take prescription and non-prescription oral pain medications. You only need to apply the gel or cream to the affected area. Obviously, those differences of Topricin vs Arnica are due to the different ingredients that they are using. On one hand, Topricin is armed with 11 natural extracts that function as biomedicines. These natural extracts are carefully selected so that they can provide pain relief without any side effect and without interfering with any other medication. The ingredients include arnica montana 6X, aesculus hipposcastanum, belladonna, echinacea, crostalus horridus, heloderma, naja tripudians, lachesis mutus, ruta graveolens, rhus toxicodendron, and graphites. On the other hand, Arnica is loaded with only one active ingredient, which is none other than arnica montana. However, the concentration is much lower than that of Topricin. This product only contains arnica montana 1X. Both Topricin and Arnica are very nice because they are unscented and they don’t leave any residue on the surface of the skin. They are easy and convenient to use. Topricin feels slightly better because it is also able to moisture the skin, making the skin feel smooth and pleasant. Topricin tends to deliver its effect more quickly. This is most likely because it contains higher concentrations. It is more potent. Arnica is also effective for relieving muscle pain, but the effect does not come up as quickly. Topricin is indeed a better product. It is able to treat several different kinds of pain, including the ones caused by arthritis and carpal tunnel syndrome. It also contains higher ingredient concentrations. As the effect, it is more potent. It can deliver the results more quickly. Arnica is only suitable for treating muscle pain and stiffness, and is not as potent.